Video release of Ruth Allen’s ‘You’re Never Too Old’ concert performed in LA on January 13, 2019. A week before her 90th birthday. Ruth's Musical Memoir, I'll Still Be Me is available now online. See details of how to purchase in the Musical Memoirs page. After the war, under her stage name, Ronnie Graham, she began recording as the 'talk of the town' – the girl with the white grand piano at the chic Astor club in Berkeley Square and touring Europe where she met Billie Holiday at the Mars Club in Paris. But she never lost the passion to sing and write songs. 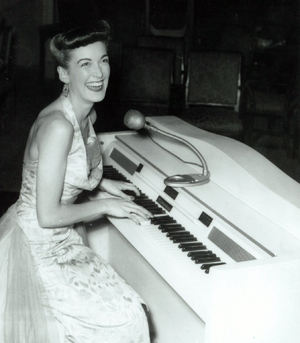 In New York, after meeting and performing for Duke Ellington, she was offered a contract by Columbia Records, performed her own composition in a royal Command performance in England, spent eight years as the resident singer/pianist at London's famous American Bar at the Savoy Hotel and appeared for Michael Feinstein in New York at Carnegie Hall. Still recording and performing today, Ruth is also hoping to see her East End Musical 'Ring Out the Bow Bells', with 18 of her original songs, on stage in the near future.